Tonight I had some MAJOR deja vu. I was eating dinner, and was magically brought back in time to eating fried fish and chips with my family at Ronnie’s Seafood on the side of Route 20 in Auburn, Massachusetts. The only difference? Instead of deep fried haddock I was enjoying an amazing, easy vegan meal in my own home. The vegan meat industry is rapidly crowding with the latest in burger analogs and hot dog fake outs. But the vegan fish space seems to be pretty vacant. Tartar sauce, fries, and fish? All vegan!!??? 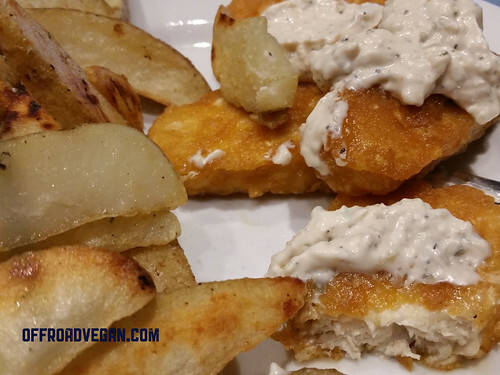 Enter Gardein’s Fishless FIlets. And they are absolutely amazing. Simply place them on a baking sheet and bake for about 15 minutes, along with some fries and you have a trip down memory lane. The filets are actually packed to the gills (see what I did there!?) with Omega 3 fatty acids (just like fish) and are healthier for you, in terms of fat content and a complete lack of mercury. On the fork, they flake and cut just like the white fish that is so common in New England. The breading was crisp and delish. I paired the filets with Follow Your Heart vegan Tartar sauce and it completed the dinner perfectly. 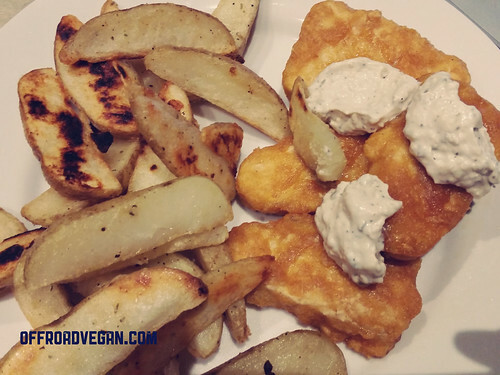 Whether you are a vegan looking for a complete fish filet substitute, or an omnivore looking to periodically enjoy an easy vegan dinner, look no further than the Gardein Fishless Filets!